Every day, Watch This offers staff recommendations inspired by a new movie coming out that week. This week: The Hobbit: An Unexpected Journey has us thinking about swordplay. In 1961, Akira Kurosawa directed Yojimbo, his most Western-influenced samurai film to that point, starring Toshirô Mifune as a roving mercenary who gets involved in a village’s bloody power struggle. Inspired by the novels of Dashiell Hammett and the films of John Ford and Howard Hawks, Yojimbo was neither as somber nor as epic as Kurosawa’s previous historical action pictures, but instead showed more humor and grit. 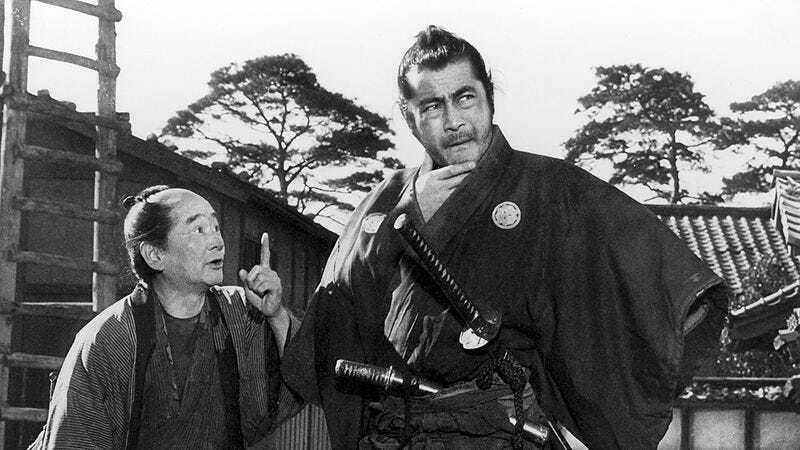 Kurosawa then amplified both of those qualities in the sequel, Sanjuro, again starring Mifune as a ronin-for-hire. In the first film, Mifune’s anti-hero judged everyone he met as unworthy of anything but a quick death by cold steel; in Sanjuro, he finds a group of samurai that he feels need his help, which he’ll offer so long as they’re willing to pay for it. But while Mifune is skilled with a blade, he’s oafish in almost every other respect, and his fellow swordsmen become exasperated at his crudity and laziness. While Sanjuro wickedly satirizes the notion of the honorable warrior, Kurosawa doesn’t skimp on the superheroism. Mifune slaughters bad guys by the dozens, and the movie’s final battle sequence is one of the most exciting full-scale swordfights in cinema history, culminating in a famous shot in which Mifune slashes an adversary who generates a gusher of blood. The arterial spray reportedly wasn’t supposed to be so strong, but the special effect went awry, and the result was so awesomely over-the-top that Kurosawa decided it suited the film. In the years that followed, American and Italian Westerns stole from Kurosawa like he stole from Ford and Hawks, and one of the biggest elements they adopted was the gory excess that Kurosawa made acceptable, and even artistic. Availability: Available on DVD and Blu-ray from Criterion, and streaming for HuluPlus subscribers.